LUBBOCK, Texas - When you're the fastest growing and improving athletics department in the nation with an interest in building a university golf course, who do you call? How about one of the country's most respected and award-winning designers, then ask him to transform a cotton field into a championship course? It's a situation where course architect Tom Doak was forced to use his imagination at Texas Tech, which is something you'll do when you play the 7,207-yard links-style layout. 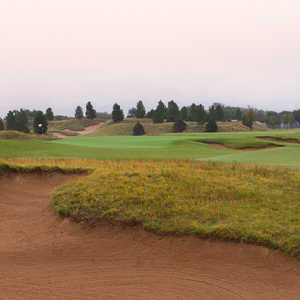 Doak designed The Rawls Course to have a flare for the old with an influence of the traditional links style of Scotland and England. More than 80 bunkers await stray drives on the wide fairways or misplaced approach shots adding strokes to your score and punishing poor decisions. The par-3 third is a true test of shot making. At 158 yards from the tips, players will find a shorter club in their hands on the tee but the enormous three-tiered green is guarded by three deep bunkers and slopes hard from back to front. Placing the ball on the same tier as the pin is a must or a three-putt is definitely a possibility. 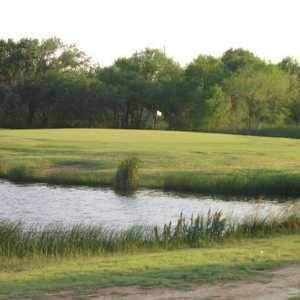 Seeing the landscape of the entire course from the third tee, you won't feel like you're in the middle of West Texas. What once was a cotton field even has a local cotton merchant praising the beauty and excellence of the course. David Canale recently became a member and gave two simple reasons why he joined. "A, because of the price and B, it's just a great course," Canale said. "It's a lot better than any other course in town - even the country clubs. It doesn't get any better than this. I don't think you'll find anything better anywhere." The monster eighth hole makes par an accomplishment. At 476 yards into the wind this hole plays like a par-5, especially if the West Texas winds blows at 30 mph - like it can any day of the week. Inaccurate long irons will be penalized. The eighth feeds left to a valley and the elevated green has four bunkers standing sentinel short and left with each one progressively deeper in the valley. Par is hard to come by, but smart play will be rewarded. The wind in West Texas is legendary and Doak took that into consideration with the harder holes on the course coming into the traditional southerly wind. The direction can change in the blink of an eye, however. Add that to the undulations and unpredictability of the fairways and Texas Tech women's golf coach Stacey Totman said The Rawls Course tests players and teaches them. "My favorite thing about the golf course is that every day it's different. The ball is never going to do the same thing out here on a regular basis depending on the wind and what part of the fairway you hit it on," Totman said. "To me it's very fair, but difficult and it's different every day. To me that's what makes my team better players because they go out and play something different every day." The back nine delivers a few more challenging holes. A tee shot on the 12th must be on the right side of the fairway if you want to see your approach shot as a left tee shot leaves a blind approach over a hill. The No. 1 handicap hole 14 is susceptible to low scores. At 499 yards, 14 had high schoolers hitting 3-wood to this par 4 during the district championship. It has more room for error than the eighth, however, making par more obtainable with well-placed shots and solid putting. Putting is a must on this course as the greens are big to match the fairways, but the undulations encourage precision on the approach. Mistakes and errant shots can be made up for as the course closes with back-to-back par-5s. Eighteen is a risk-reward hole with an approach over water. Bunkers and a false front guard the green. A true test of a golfer's ability to play smart golf and take advantage of good shot-making, The Rawls Course is a gem on the Texas Tech campus - its own piece of Scotland in Lubbock. Ranked among the top collegiate courses, The Rawls has already hosted a NCAA women's regional and will no doubt host more big tournaments. Sources have said the LPGA wants to host a tournament in Lubbock. All Texas Tech needs is a sponsor to cough up the purse money and a real club house, which is in the fund-raising stage. 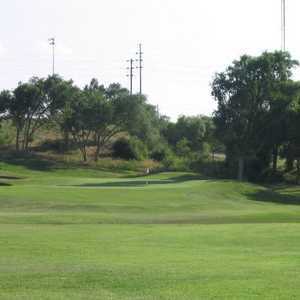 The large fairways make Rawls a player-friendly course along with the hundreds of yardage markers on sprinkler heads. The greens make putting a challenge, however. The price you pay for a course of this quality makes Rawls wallet-friendly as well. Come before 11 a.m. on a weekday and ride for $27. A course better than the three county clubs in town for less than $30 is highway robbery - or just the best deal in Texas. Don't let the temporary clubhouse fool you either. The food is good. In fact, Texas Tech administrators and coaches can often be spotted there on their lunch break. Anywhere you want. Lubbock is the nation's capital for restaurants per capita. Chain eateries abound, but for the best of the locals 50 Yard Line Steaks, Caegle's Steaks and County Line Barbecue are among the best the Hubcity has to offer. CUT THE ROUGH!!!! I mistakenly wore shorts on the 90+ deg. day to play. 5 yds. off the fairway, forget it. Cuts, scrapes, and sand burrs explain why u never see the Mens Team hunting balls. I played with a member and he was embarrassed by the conditions of the course. We also saw the same enthusiasm for the rough in the clubhouse. TURN the TV's OFF if WE can't work first.